Over the years, I took short term consulting trips. One of my mentors told me something I always remembered. It was that I should not expect to do much good on a short term assignment. So the first question is whether I was doing something for the nationals that they could do for themselves and then whether there is a better use of the time and money to reach the objective. Trips to Brazil, Yugoslavia, and Saudi Arabia were to bring new knowledge that they did not have themselves. We were invited to bring knowledge of our more advanced irrigation equipment and practices. A trip to Egypt was to inspect for the US government how Egypt had spent the dollars for irrigation improvements. One trip to Libya was to inspect for them the performance of their purchases of US equipment. So these trips fit my criteria of a reason to go to help the nationals that they could not do for themselves. I also learned something about contextualization or adjusting what was said based on local conditions. In Egypt, the civil engineer that went with me wanted to judge their bridges over canals based on US standards. I judged them based on whether I thought they were built to have a reasonable life. In the US 40 years ago, center pivot irrigation was coming on very strong. It required little labor but many dollars. I did not promote pivots for the Yugoslavians because they had low cost labor but not many dollars to purchase the equipment. Our first trips were to Mexico to support a Bible College. Later, we extended a modified US Jesus Film program to northwestern Mexico. About 100,000 DVDs were given to churches. It was kept to one per family so they shared with their family, relations, friend and business acquaintances. We hired three nationals for 2 1/2 years to cover over 1,000 churches. The Jesus Films were also used in prisons and on buses. As stewards of what God had given us, we visited approximately every quarter to review results. We saw church growth from the work. Later, we continued support for the key leader because he was instrumental in continuing to lead Tijuana citywide evangelism. We went to the Mideast on a trip to evaluate results of funding there. We quickly learned that each area and sometimes a country requires different programs. Later, we gave to Strategic Resource Group (SRG) covering the Mideast and North Africa to spread the gospel and disciple. They vetted 300+_ national groups to fund. We later applied some of their concepts when we focused on India. It does not take much world knowledge to see that many countries do not accept American missionaries. However, with today’s technology, there are many ways to bring the gospel to these countries as SRG does. American missionaries’ work is hampered in countries such as China, India, and the Mideast, where foreign Christian missions work is illegal. There are American missionaries in some of these countries working bi-vocational when national Christians could do the work full-time for much less money. There are other ways of reaching some of these countries for Christ including media. We learned an interesting reason why Americans continued to come long term as missionaries. The Mideast leader said it was easier for an American to raise $70,000 than for someone from their area to raise the $10,000 for a national to support themselves. Is this taking the easy way out for American Christians? We were part of training teachers in Russia after Communism fell. The material they could then use included the Jesus Film, apologetics, and other Biblical material. There was a vacuum in belief that the Russians wanted to fill so we were bringing knowledge that was not available from the nationals and a program that needed American assistance; however, we were required to have teaching or management experience. About 25 years ago, we went to India on a Jesus Film project. The films were not getting coated thereby reducing their life. The director was looking for a US business person to help. We visited two film manufacturers and negotiated with one to buy the equipment to do this. We also saw the need for a generator when the power went off during duplication. They would restart duplication each time after a power failure. So we had knowledge that was not evident from them. My negotiating skills I had learned from my dad on a small Iowa farm were used. 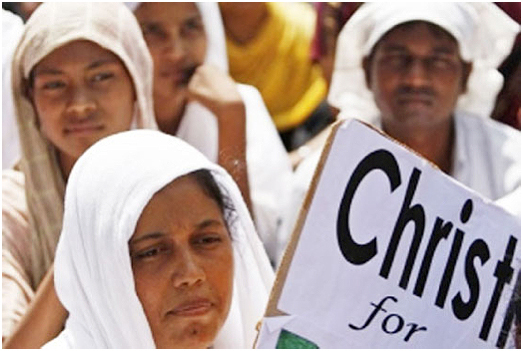 We got to see Christian Indian leaders not needing much of our help. They could do evangelism, discipleship, and training, and knew many languages and the culture. As we started focusing on India on church planting about six years ago, we took another trip to evaluate over 12 Indian mission groups we had or were considering supporting. Since it is very difficult to do this even in many trips, we hired someone to do this for four years. He took two five to six weeks trips each years. He had some previous experience and was more willing to live where they lived to evaluate their work and results. However, we continued our own studies thru others and our readings. Another interesting trip was to an Eastern European country to visit a student that had stayed with us years earlier. A Christian conference was occurring and we were invited to attention. It was a mission organization that mainly worked thru nationals. However, I was surprised at the number of Americans. One of their American leaders had told me earlier that when they started a new country ministry, if the American was given a one way ticket, you would usually see more Americans coming. With a two way tickets, the ministry was more quickly built thru nationals. I have seen this principle in business that taking the easier way out often was not the best way. We passed up one trip my wife still believes we should have gone on. As our business improved 25 years ago, we were able to give $25,000 for a Jesus Film translation for Russia. We were invited to the premier showing. Our desire was to go; however, we concluded that the $5,000 in travel expenses could be much better used for additional mission giving. I guess at that time, we had only started to learn how to evaluate giving results. We went to Cuba with hundreds of other Christians. The communist government was concerned and cut off local contacts. But it did give me a US government approved visit. I went to Haiti to help a Haitian leader with Partners Worldwide who is successfully helping businesses to create jobs. American businessmen go oversees on short term trips as advisors. 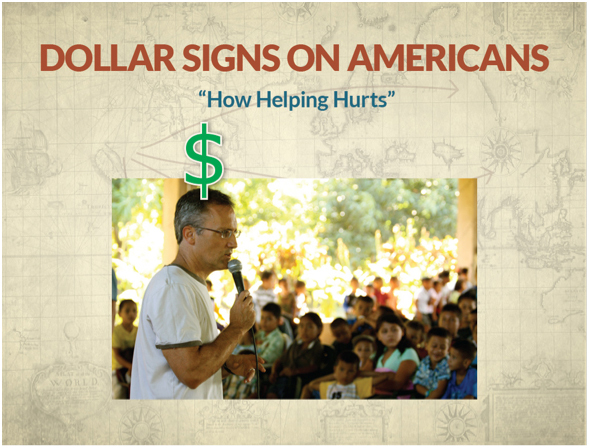 An American on an overseas missions trip needs to remember that nationals usually see a dollar sign and pay more attention because of the possibility of getting American dollars. Taken from “When Helping Hurts” by Steve Corbett & Brian Fikkert. We have always kept evaluation and inspection costs below 5% of what we give for a mission project. (1) Corbett, Steve & Fikkert, Brian. When Helping Hurts. 2009. Illinois. Moody Press.